Last year our senior pastor (Todd Wagner) and his wife spoke to a group of parents on the topic of “Leaving A Godly Legacy.” During their talk they mentioned they like to regularly ask their children a set of questions that gives their kids a chance to give them feedback and help them measure how they are doing at modeling for them the things they hope they are modeling for them. (Deut 6:4-9) While the specific questions change each time, the general idea is still the same, a chance for their children to give them direct feedback on their full spectrum of parenting and leadership. 1. What are the top 3 things your Mom and Dad are most passionate about? 2. What is something we do as a family that you definitely WANT to do with yours? 3. What is the one thing we do that you are SURE you WILL NOT do with your kids? 4. What is your favorite part of being a Wagner? 5. What is your least favorite part of being a Wagner? 6. What is something you wish we would do more as your parents? 7. What is something you wish we did less of as your parents? 8. On a scale of 1-10 I think my parents love me ________. What questions would you add to this list, and in what ways do you engage and initiate conversation with your children? Leave a comment below and tell us about it! 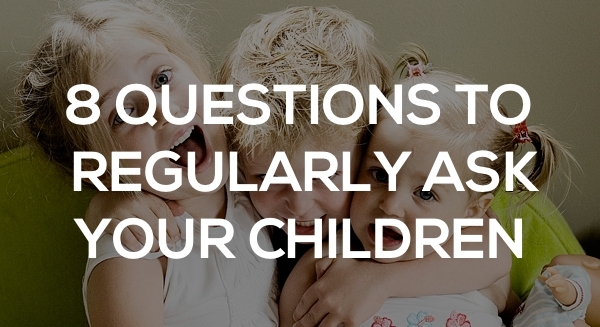 The post 8 Questions Every Parent Should Regularly Ask Their Kids appeared first on Watermark Community Church Blog.